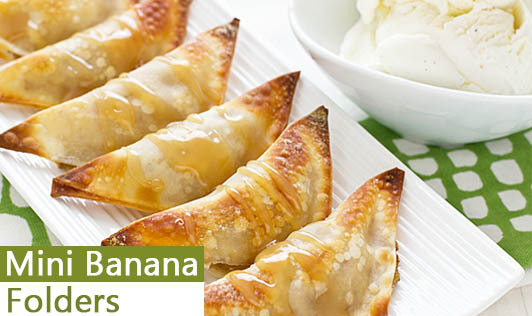 If you are a person who likes the taste of whole wheat rotis stuffed with sweet, carbohydrate rich bananas, give this a try! The kids will go bananas over this nutritious breakfast. 1. Take the flour in a bowl and knead into a soft, smooth dough using water as required. Keep aside. 2. Divide the dough into 8 equal portions and roll out each portion into a thin 4"square. 3. Cook each square on a non-stick pan on one side. 4. Place a square on a clean, flat surface with the cooked side facing up. 6. On the cooked side spread 1 tbsp banana evenly on half of the roti, put 1 tsp of the marmalade and sprinkle ½ tsp sugar evenly over it. 7. Fold to make a semi-circle. 8. Cook on a non-stick pan using a little ghee till it turns golden brown on both the sides. 9. Repeat with the remaining ingredients to make 7 more folders.